For Spring/Summer ’08/’09 in Perth it appears it is not only fashion that is in full bloom – with the Art Gallery of Western Australia’s beautiful ‘Art in Bloom’ exhibition on display in August. I also found it telling to discover the crane reflected on the glass of the window in this picture – as the city is currently inundated with them. 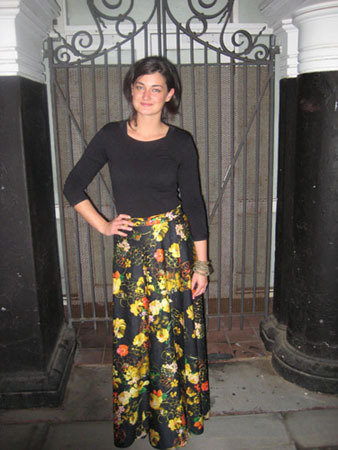 Susannah wears Metallicus tops and vintage skirt from La La Orange. Like all classic items – the Converse shoe, the Chanel 2.55 quilted handbag, a crisp white Ralph Lauren shirt – Ray-Ban wayfarers are a style staple that are here to stay. In the milder winter months all a Perth girl needs to stay chic and cosy is a rockin’ dress and a great pair of tights. Magda told me she wanted to customise something for herself and so she bought an XXL Bonds mens shirt (worn as dress) and cut and painted it.Her boots are from Bally, King Street and necklace is from Kul Kul in Subiaco. 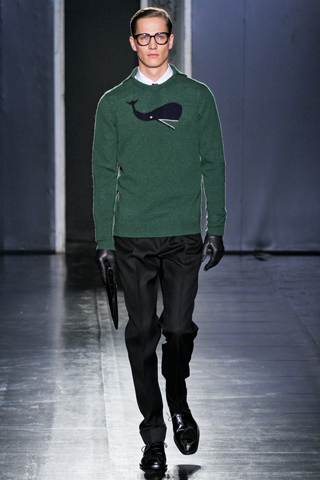 This winter black is the new black! 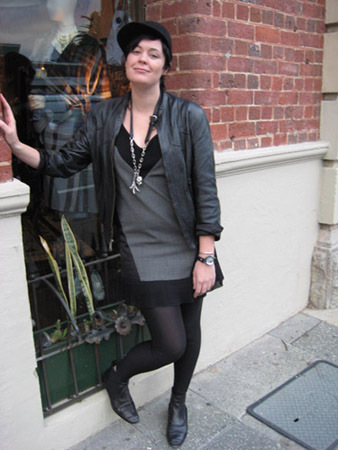 Hannah, Manager of designer boutique Dillettante (cnr King and Wellington Streets) wears Undercover dress, vintage leather jacket, Alexander McQueen necklace and Christopher Kane for Swarovski crystal bracelet. In perfect timing for the release of the Dark Knight – the Perth fashion pack (maybe as an ode to Heath) are all dressed in black. Chris wears Gram shoes from Subway DC, Genae jeans from Brave New World, John Smedley jumper and vintage leather jacket. Didi wears Preen jacket, Vivienne Westwood dress and Converse shoes. For those of you who want to get noticed in the winter months and bypass the all black trend, refresh your pallet with a statement shade of nail polish. Style tip: Unless you are 6ft tall and have long slender fingers like my friend Kylie here, opt for a short buffed, boyish nail length.